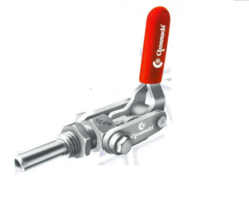 Our range of products include air operated straight line toggle clamp, vertical toggle clamp, right angle hold down clamps and push pull clamp. 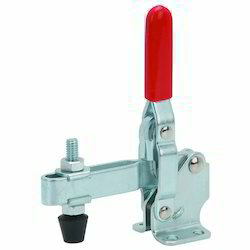 We are one of the most prominent manufacturers and the exporters of the Air Operated Straight Line Toggle Clamp. The linkages are heavy punched sections. The shaft is of Alloy Steel, hardened, tempered and ground to close tolerance. These are used in various applications and also these products have many features which are attracted by our customers. These are available in the market at legitimate prices. AO-TC-2LH 32 31 75 215 12 98 410 M8 40 75 1200 kg. AO-TC-1LH 67 50 100 280 25 150 665 M16 65 100 3000 kg. 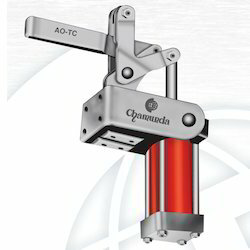 Our organization offers a comprehensive range of Vertical Toggle Clamp. We manufacture this Vertical Handle & Horizontal Arm Clamp by using superior grade material. AO-1(SB/AS)V 98 125 110 130 16 25x12 240 640 65 100 1500 kg. AO-2(SB/AS)V 57 124 100 100 12 25x22 170 500 65 100 1000 kg. AO-3(SB/AS)V 46 90 80 70 12 20x15 102 380 40 75 750 kg. 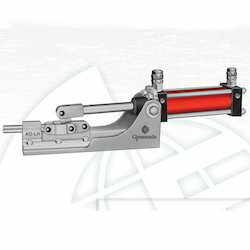 We are one of the most famous manufacturers and exporters of Right Angle Hold Down Clamps. Our professionals strive hard to deliver quality products at cost effective prices within the stipulated time period. These products are highly appreciated by our clients for their features. These are available in the market at cost effective prices. AO-TC-2FS 65 100 100 75 10 20x25 400 225 40 100 300 kg. AO-TC-1FS 65 100 100 75 20 40x30 430 240 65 100 900 kg. We are the leading firm in the industry, offering the wide array of Vertical Hold down Clamp that is acclaimed for high quality and durable standards. Looking for Air Operated Clamp ?